It’s not supposed to happen like this. I’m at a bar, one of those dimly-lit, sophisticated paeans to conversation and alcoholism, possibly even seduction, if things happen to go well. I’m surrounded by an Irish Booker Prize-winner, a high-ranking British diplomat, an Australian writer with more than 40 books to his credit, and a fellow who once wrote a book that got turned into a film that made millions weep and made millions at the box office, amongst several celebrated others. We’re seated in a circle, with a mild tropical buzz and the warmth of good spirits permeating the air. The conversation isn’t some dour literary affair brimming with pretention, but a lively one, filled with good-natured ribbing, some epic tales from the literary circuit, and laughter-filled banter. So, to repeat my initial observation: it’s really not supposed to happen like this, is it? At literary festivals, the script is meant to play out quite differently. Authors don’t hob-nob with one another, and certainly don’t go about sharing secrets that could get them into all sorts of trouble (or onto the front page of The Sun, whichever comes first). And there is the long-standing tradition of a Writers’ Hierarchy, wherein the cream of the crop are separated by a suitable layer of indifference from the rest of the hordes, themselves sub-divided into several classes of species, each with vastly different seating places and session timings. There are the literary agents, hanging on desperately to their prized catches, trying hard to shield them from the clutches of any prowling predator. Which leaves you with the tantrums, of course, with the likes of Salman Rushdie refusing to get out of bed for less than $10,000. Wait, maybe I got that last bit mixed up with something else, but surely you get the point. Then why are things moving along in such, well, convivial fashion? 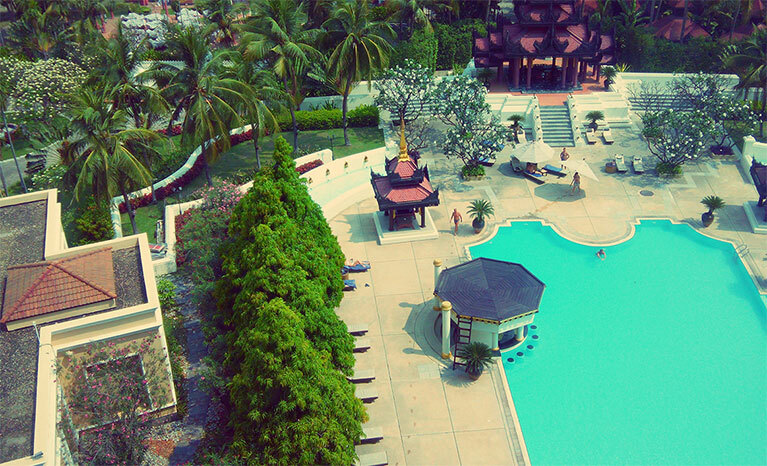 The Mandalay Hill Resort, venue for the Irrawaddy Literary Festival. The answer might well have something to do with the fact that the festival in question is the Irrawaddy Literary Festival. Now in its third year, the I.L.F. is Myanmar’s charming entry onto the global literary stage, and in a sense, its entry into a global consciousness that till not so long ago, only viewed the nation through a prism of violence, military-rule, and conflict. Thus, in its short lifespan, the festival has come to be viewed as many things already—a beacon of hope, a harbinger of change, and a symbol of the country’s persistent, if somewhat shaky, path towards genuine democracy. “Every year, we’ve been on edge till the last moment, wondering if things are going to fall into place,” Jane Heyn, Festival Director, tells me. Jane, soft-spoken and gracious to a fault, together with her husband, the equally amiable Andrew Heyn, former British Ambassador to Myanmar, is undoubtedly the driving force behind the Festival. Not only is she responsible for its conception, but along with Andrew, former British Ambassador to Venezuela Giles FitzHerbert, and an extremely tiny circle of insiders, she has helped nurture its ambitions and nourish its soul. In its short lifespan, the festival has come to be viewed as many things already—a beacon of hope, a harbinger of change, and a symbol of the country’s persistent, if somewhat shaky, path towards genuine democracy. The festival is being held this year in Mandalay, an instant catalyst to thoughts of poetry draped in romance and a land draped in mystique. It takes its name from Myanmar’s lifeblood, the country-traversing Ayeyarwaddy river, but defers back to its old name. Hence, Irrawaddy. This year, as in every year, problems have been aplenty: sponsorship is minimal, with the Heyns having taken the brave step of refusing any large corporate sponsorship that goes against the festival’s principles; the money that is on offer is, more often than not, connected directly to an old dictatorial past, thus presenting an even larger conundrum; there is a sore scarcity of books from each speaker, with strange laws and a weak distribution system being the main culprits; the political climate is volatile, with clouds of uncertainty looming over every move and decision; there is the nearly insurmountable wall that exists between the Mandalay group of writers and the writers from Yangon, the capital; and finally, there is the acute nonappearance of the Festival’s patron, Daw Aung San Suu Kyi, without whose enigmatic presence viewership and attendance figures dwindle. And yet, somehow, things seem to fall in together. The exquisitely planned Mandalay Hills Resort becomes our address, with a few of its rooms playing host to a bevy of sessions, readings, screenings, and discussions. The lawns of the resort are bedecked with a few tents, with authors doing whatever they need to in order to get their books into the country. And wouldn’t you know it, despite threats of a walkout being staged nearly every day, the country’s two warring faction of writers manage to kiss and make up, in a manner of speaking, even exchanging a rare moment of togetherness during the festival’s closing ceremony. The international authors, around thirty of us, gel together quite naturally, with reading sessions being exchanged to suit each other’s timings, authors taking up the cudgel of moderating a session or introducing a session featuring one of their compatriots, and other instances of good-natured altruism. 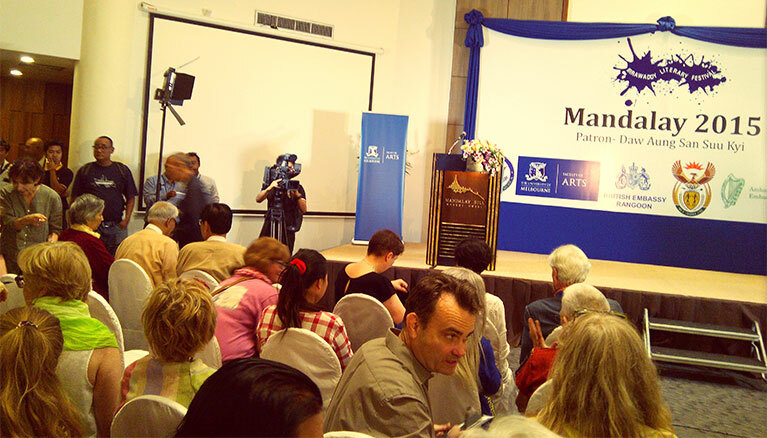 Opening Ceremony of the Irrawaddy Literary Festival. It is this sense of bonhomie, complemented by a fiercely gritty D.I.Y. ethic, which has helped the I.L.F. eke out a place of its own. The sense of camaraderie, intimacy, and free spiritedness at play here can’t be forced or planned. It just is. Put it down to the festival’s still-cozy size, put it down to the founders’ organisational skills, put it down to the enthusiastic team of volunteers and their sincere passion for words, or simply put it down to the authors themselves, but Irrawaddy has a charming heart that skips to its own bohemian beat. What am I doing here, you may well ask? Well, I’m a writer. And my debut novel, Letters from an Indian Summer, was released in the winter of 2014. Which suits me quite well. I have a solo session where I read a few passages from my novel and engage with an attuned audience. My next session, a group discussion with two wonderful debutante authors, Rosalind Russell and Helena Thorfinn, goes off even better, which makes me very happy—and makes me want to drink some more. At times, I find myself in rather surreal spaces, like when I’m discussing the fine art of rearing children, with Louis de Bernières, or escaping away with Colin Falconer and Michael Buckley to the Mahamuni Pagoda. Like when I’m engaging Indian author Ratna Vira and her daughter in animated conversation, or delving into stories dappled in sepia with Anne Enright. Like when I’m discussing Moroccan writer retreats with Jan Cornall or tucking into grilled Burmese BBQ with Irish author Joseph Woods… well, you get the picture. 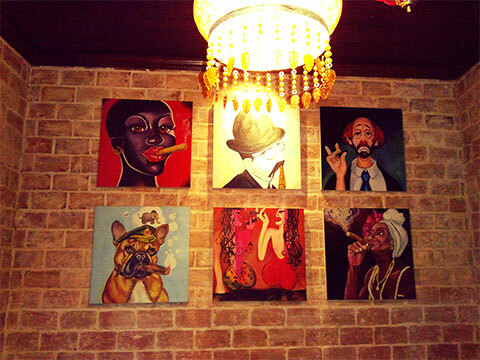 The Kipling Bar, a late-night haunt with plenty of character. Between meals, between conversations, between impromptu journeys into Mandalay, I take in a plethora of soul-stirring sessions. The Man Booker Prize-winner Anne Enright is a particular standout, her lilting Irish cadence bringing words of sorrowful poignancy to vivid life. British author and cultural historian Rupert Arrowsmith is seemingly everywhere, and delightfully so, delivering opening ceremony addresses, his individual session on the Face of the Buddha, and closing ceremony summations with equal amounts of charm and ease. Louis de Bernières, the author of Captain Corelli’s Mandolin, brings his customary wit and love for adventure to the table. Sessions by Michael Buckley, the award-winning Canadian eco-warrior/documentary filmmaker, and Barnaby Phillips, the award-winning British journalist, offer stern examinations into the effects of megalomaniacal greed (as in China’s case) and a forgotten chapter from the annals of war (this time, featuring an African soldier). There are a few impassioned Burmese appearances, inclusive of poetry and Buddhist discourses, which I manage to tap into via the fairly shaky amateur translation system. There is a strong contingent from the University of Melbourne, led by the endearingly industrious Jacqueline Dutton and featuring, amongst others, renowned Australian journalist Margaret Simons. The Australian contingent and I form an immediate bond, both reaching and leaving the festival on the same flight, genuine friendships having been forged. It’s at the resort’s Kipling Bar, first mentioned at the beginning of this piece, where many of our diverse experiences, tales, journeys from the past, and hopes for the future come to rest. The stylishly appointed bar, though a tad desperate in its bid to create that classic British vibe, ends up becoming the de-facto address for that “one” nightcap that lasts well into the night. Nursing a perfectly textured red wine one night, submerged by the sounds of laughter and promises to keep in touch, I take a step back for a while. I think about my book. I think about when I’m going to be invited to my second literary journey. I think about these wonderful people, and whether we’ll cross paths again. And then I think about the next festival: what if it’s a larger one, what if people don’t speak to one another, what if pompousness rules the day? But I dismiss these thoughts with a wave, because we’ll always have Mandalay, won’t we? Siddharth fled advertising for his true passion—words. Letters from an Indian Summer was released in the winter of 2014. It tells the story of an Indian photographer and a French artist caught in a tidal wave of love, travel, sensuality... and destiny. Visit his website here. By Saudamini Kalra · Bhutan has been described by travellers as the Johnny Depp of the world — reclusive, a bit odd, but endearing nonetheless.